This Connection was conceived in early 2013 but by now (Jul 2017) has been in gestation for rather more than four years, mainly because I lacked the self-confidence to proceed with it. As per (at least) 97.5% of the rest of my family connections, its contents have come as a complete surprise to me. focussing on the central entity of Thüringen, aka Thuringia, renowned for its vast forests, mountain peaks and mediæval villages, and also for Martin Luther's links with Erfurt and the Wartburg in Eisenach (where he translated the New Testament into demotic German). In the early nineteenth century, however, these attractions began to pall on the more restless members of the Weidner family, and they headed northwards for the greater economic opportunities in England. That sounds a bit ironic now, doesn't it? Though the next two images are slightly out of context I'll leave them where they are FTTB. Like Job, Geoffrey was not a man who went looking for trouble, but it went looking for him. 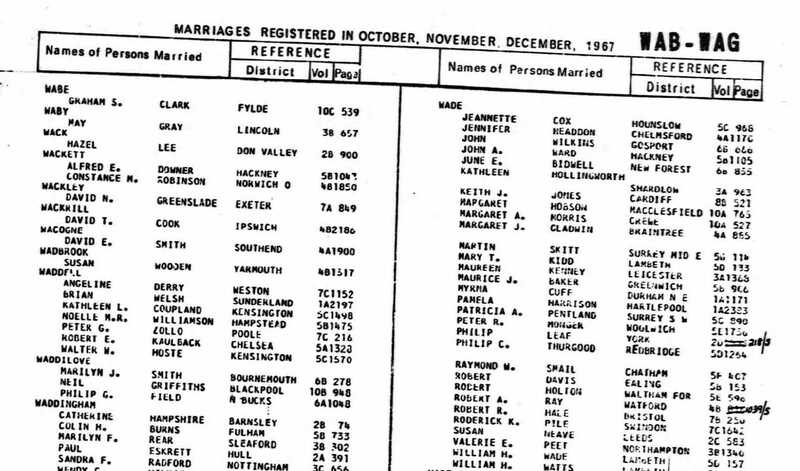 My father's marriage was the first, to Jane Hoste at the Kensington Registry Office on 16 Nov 1967, followed by my marriage to Sonia Kaulback at Chelsea Old Church on 16 Dec 1967, and my mother's marriage to Geoffrey Coupland at the Kensington Registry Office on 22 Dec 1967. The ceremony was witnessed by her loyal and longstanding friend Joanna Malcolm-Baker (whose address had been given as Katie's residence), and Joanna's affable but unassertive companion J Wilfrid (sic) Fox, distinguished by a remarkably florid nose and reputed partiality to Dickens. As far as I know, there was nobody from Geoffrey's side in attendance. The marriage was disastrous, and I strongly suspect that Geoffrey had serious reservations about the venture, which were compounded on the day by the discovery that Katie was eight years older than himself. Her economy with the truth about her age was the first crack in what was already a shaky edifice. Sonia and I both liked Geoffrey immensely, and sympathised with his increasingly difficult predicament over the three turbulent years that followed, but Katie's veto on any further communication with him following the events of New Year's Day 1971, meant that we lost touch with him entirely. In expiation of our compliance, I'd like to give an outline of his most interesting background, deriving entirely from the internet and (yet again) good old ancestry.